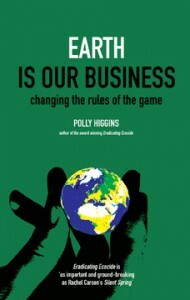 In 2010 international environment lawyer and activist Polly Higgins proposed to the United Nations Law Commission that Ecocide be made the fifth Crime Against Peace as a way of halting the degradation of the environment. 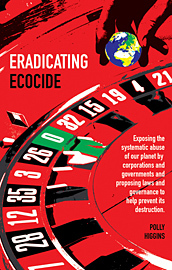 In Eradicating Ecocide, she argues that our planet is fast being destroyed by the activities of corporations and governments, facilitated by ‘compromise’ laws that offer insufficient deterrence. Under her proposal, a law of Ecocide would create a duty of care, a duty owed collectively by humanity to the Earth. She distinguishes between Trusteeship Law which is about putting the welfare of the beneficiary first, as distinct from Property Law which views the Earth as a tradable commodity. This requires a change in our values. In her second book, Earth is our Business, she takes up the issue of a change in our values. The purpose of the Law of Ecocide is not to imprison those who offend against it, but to redirect economic activity from current practices towards a sustainable economy. To read more, click here.